Perfectly processed foods, every time. 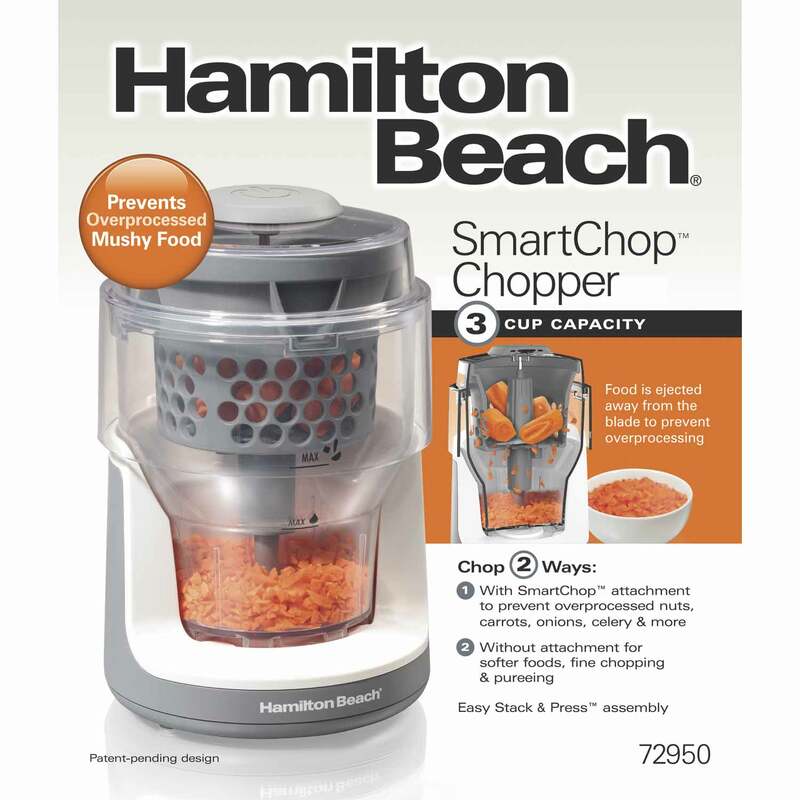 Overprocessing foods with a food chopper is one of the quickest ways to ruin a recipe. 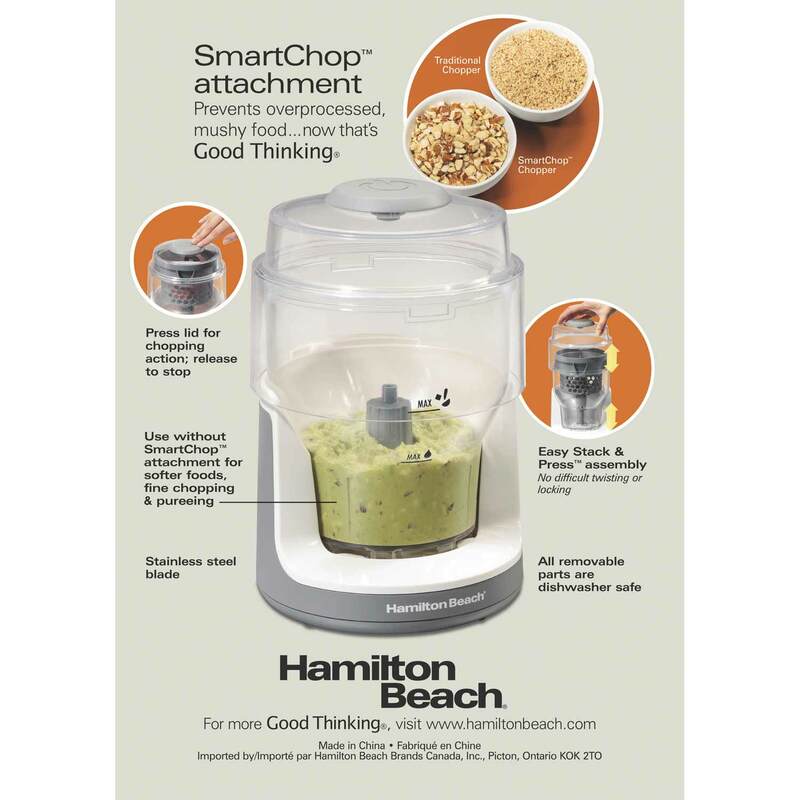 Achieve the right consistency for your ingredients every time with the Hamilton Beach® SmartChop™ Chopper. Not only does it speed up food prep by handling the chopping, mincing and mixing for you, but the patented SmartChop™ attachment releases ingredients down into the bowl when they reach the ideal size, making it next to impossible to overprocess foods. 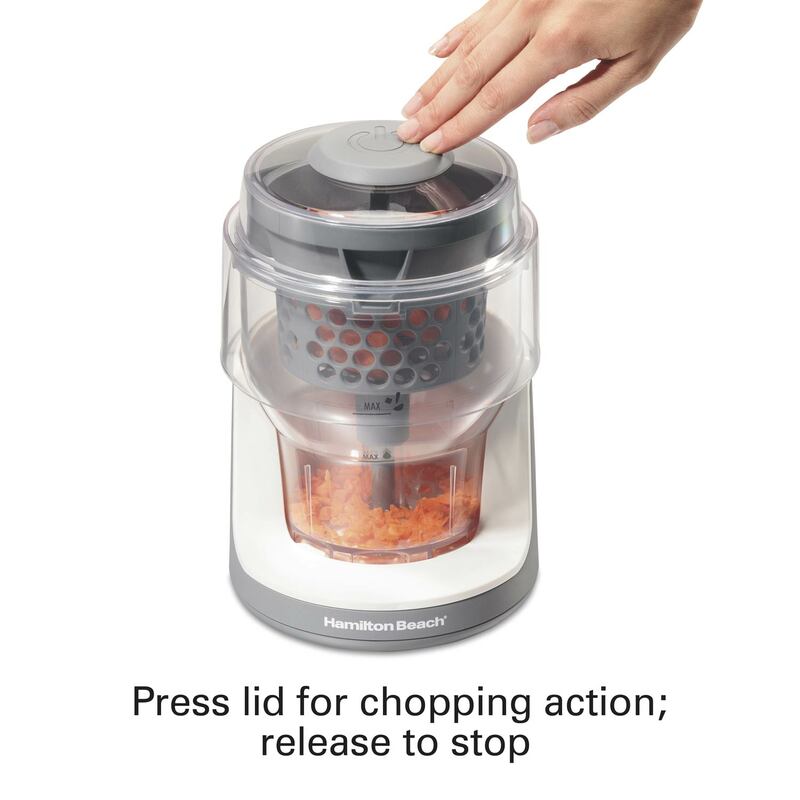 There’s no twisting or locking to set up this chopper thanks to the Stack & Press™ assembly; simply stack the bowl in the base, then insert SmartChop™ attachment, adapter and blade before placing the lid on the bowl. 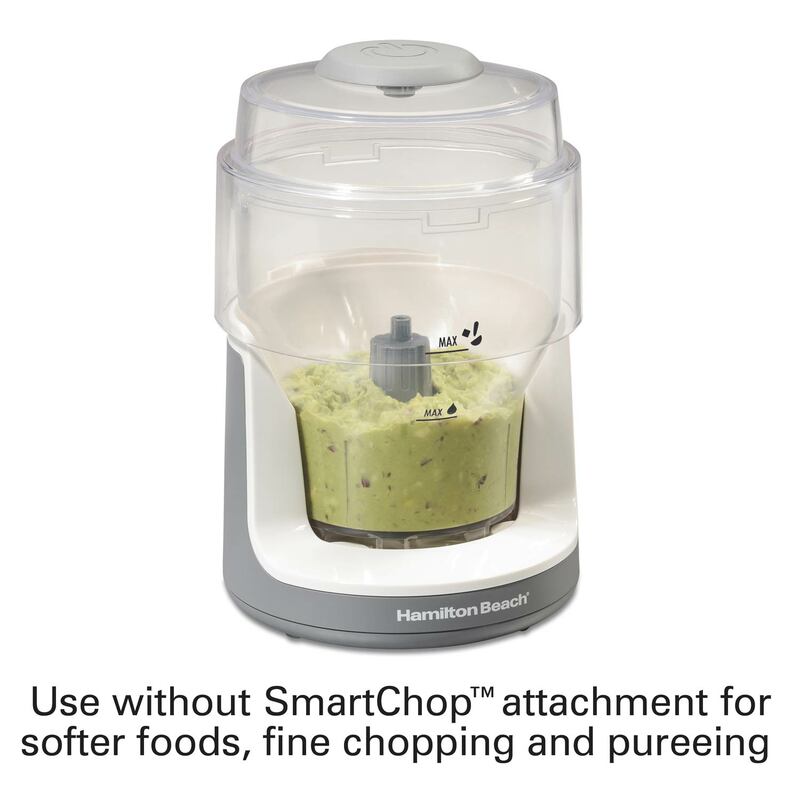 Or, forego the SmartChop™ attachment altogether for a finer cut, perfect for softer foods and purees. Press the lid to chop, and release when you have the desired consistency. Additional features, like dishwasher-safe pieces and a 3-cup capacity further simplifies meal prep. 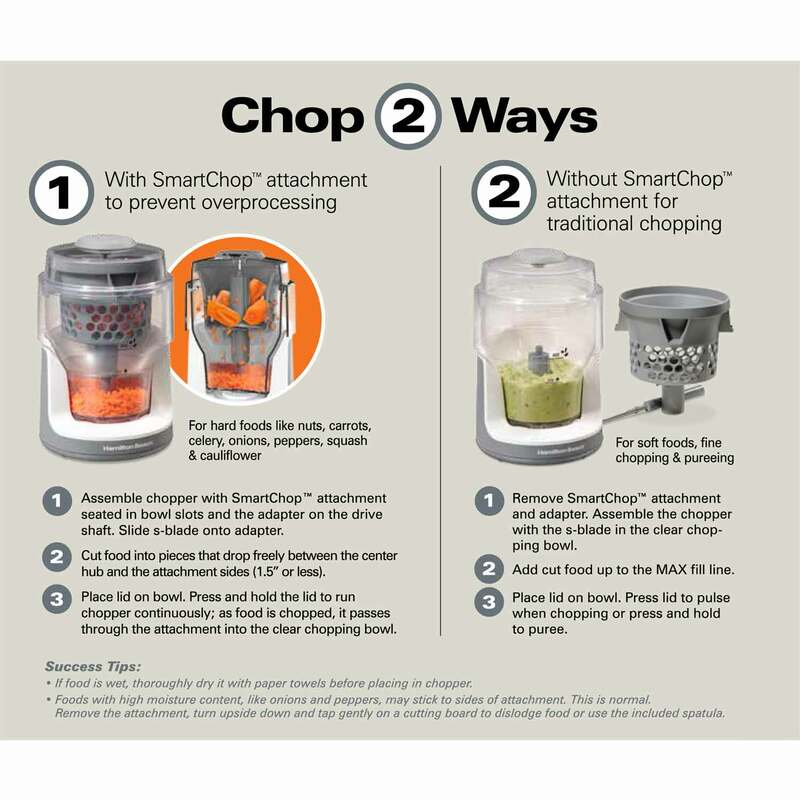 The SmartChop™ Food Chopper works two ways to produce ingredients of the perfect size and consistency for your recipe. 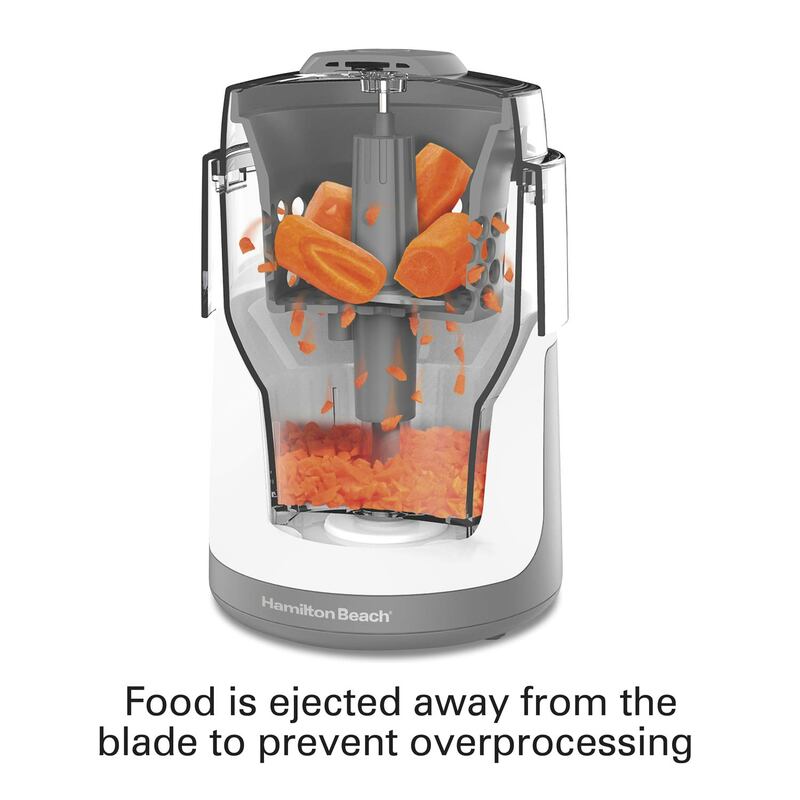 Use the SmartChop™ attachment to prevent overprocessed nuts, carrots, onions, celery and more, or use it without the attachment for traditional chopping of softer foods, fine chopping and pureeing. 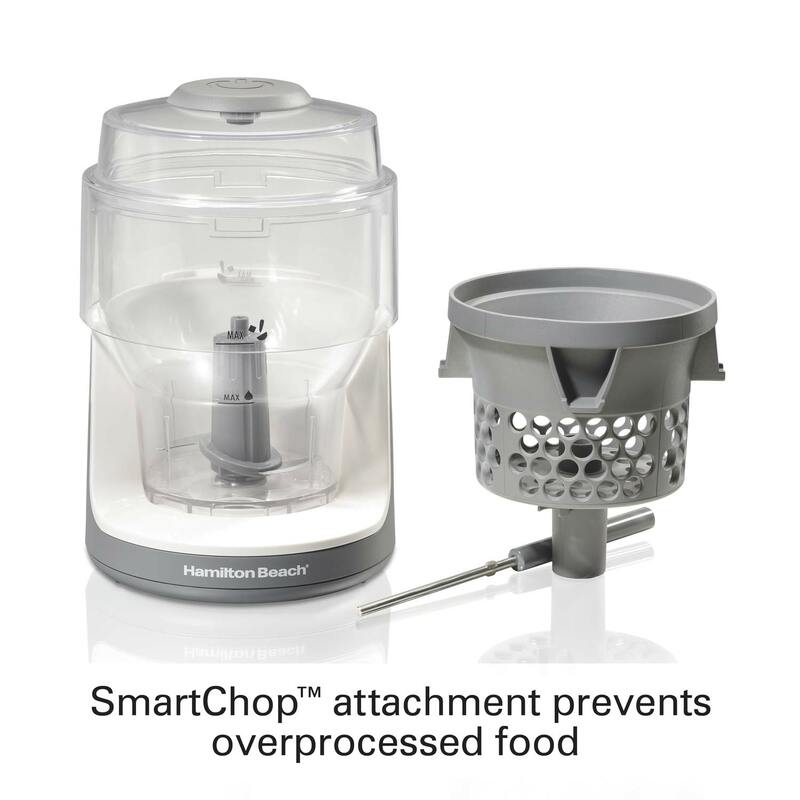 When using the SmartChop™ attachment, the food will pass through the holes in the attachment as it’s chopped and dispersed into the clear chopping bowl below so it doesn’t ever get overprocessed. 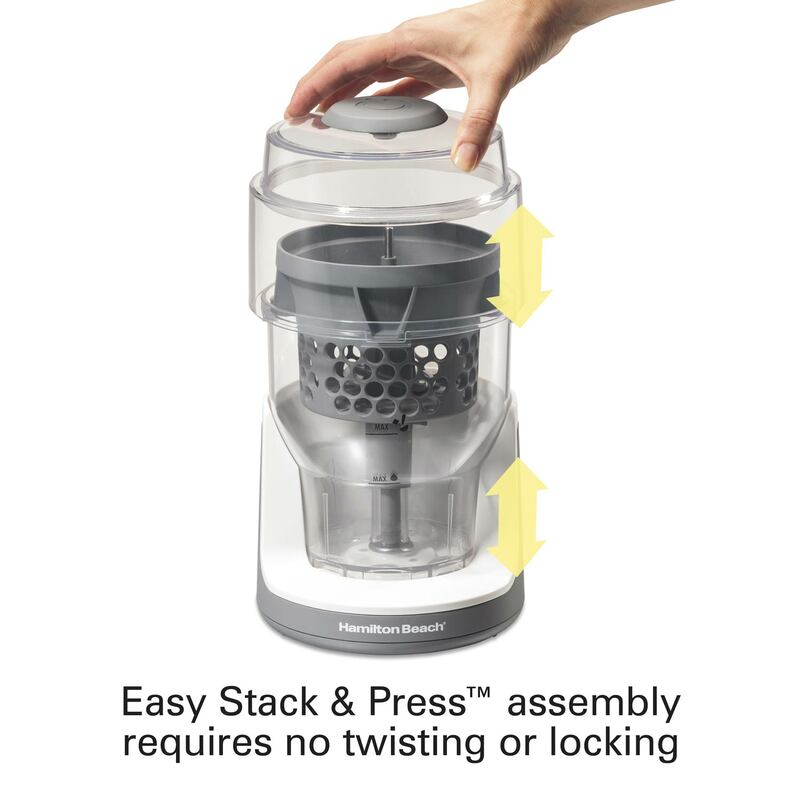 No need to fuss with twisting and locking parts into place thanks to the easy Stack & Press™ assembly. Simply stack the bowl onto the base, followed by the SmartChop™ attachment, adapter, blade, ingredients and lid. Once you’ve added your ingredients, press the lid down to chop. Then, release to stop. 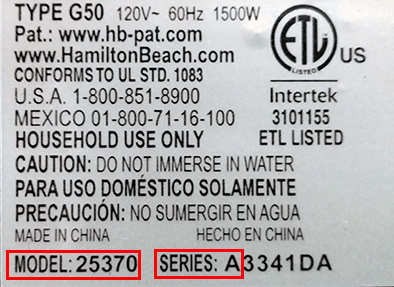 The bowl, lid, attachment and stainless steel blades are all removable and dishwasher safe. The dual-sided cleaning brush and spatula, included, helps dislodge stubborn food, further simplifying cleanup. Asssemble chopper with SmartChop™ attachment seated in bowl slots and the adapter on the drive shaft. Slide s-blade onto adapter. Place lid on bowl. Press and hold the lid to run the chopper; as food is chopped, it passes through the attachement into the clear chopping bowl. Remove SmartChop™ attachment and adapter.Slide s-blade into the clear chopping bowl. Add cut food up to the MAX fill line. Place lid on bowl. Press lid to pulse when chopping or press and hold to puree. If food is wet, thoroughly dry it with paper towels before placing in chopper. Foods with high moisture content, like onions and peppers, may stick to the sides of attachements— this is normal! Just remove the attachement, turn upside down and tap gently on a cutting board to dislodge or use the included spatula. When using the SmartChop™ attachment, keep food below the holes, and reference the MAX fill line for food and MAX fill line for liquid for best results. For softer foods, fine chopping or pureeing, use the S-Blade without the SmartChop™ attachment. Foods like avocado, chickpeas, garlic, ginger, green onions and tomatoes work best with this option. For firm foods, use the S-Blad with the SmartChop™ to prevent overprocessed foods. A variety of foods are ideal for use with the SmartChop™ attachment, including: apples, broccoli, cauliflower, carrots, celery, cheese, cucumbers, fresh herbs, mushrooms, nuts, onions, peppers, toasted bread or crackers, and zucchini. 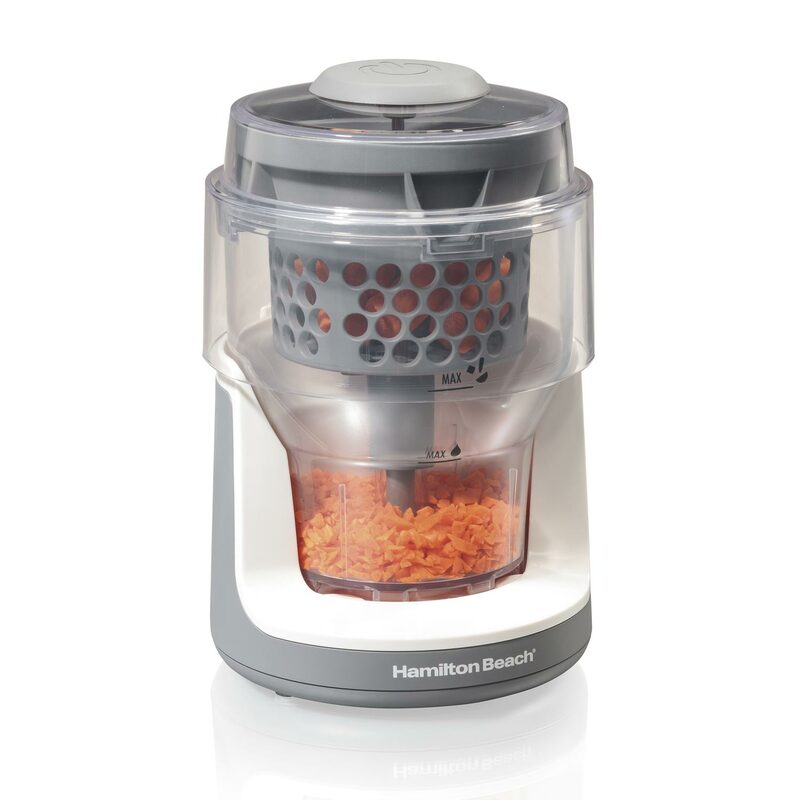 Avoid processing ice, raw meat, coffee beans, or whole, hard spices in the food chopper as this could damage it.